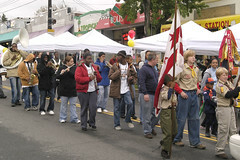 Brookland, one of Washington DC's Main Street communities, will hold its 11th annual Brookland Day Festival on Saturday, September 29th, 2007. The festival is a community-oriented event for all ages and it always captures and highlights the special small-town-in-town flavor of Brookland. At 10:30 a.m., a parade featuring bands and the Festival's spoof brigades of neighborhood residents, including phalanxes of dog walkers, lawnmower pushers, and baby stroller pushers, will march up 12th Street from Franklin Street to Michigan Avenue, NE. Between 12:00 p.m. and 5:00 p.m., performance and exhibit pavilions, including nonprofit organizations, businesses, and arts and crafts exhibitors, will be featured in booths along Brookland's commercial district, on 12th Street, between Monroe and Otis Streets, NE. Performance stages will feature the ADTI Inspirational Choir and Moroccan Ensemble led by percussionist Jason Walker, the Archie Edwards Blues Foundation, Bemcha - a latin Jazz ensemble, the Backyard Blues Band with members of Barrellhouse Brawl, the salsa group Movimiento, the Brian Settles jazz trio, and demonstrations by Northeast Tae Kwon Do, Dance Place's Carla & Company, and DC World Beat Ensemble, among others. You can view the complete performance schedule here. Click here to see a slide show from the 2006 festival. Entertainment & Exhibits, 12:30-5:00 p.m.
Arts & Crafts Fair, 12:30-5:00 p.m. The Festival is sponsored by Citibank, DC Lottery, Douglas Development Corporation, EYA, Mayor Fenty's Constituent Services Fund, Horning Brothers, Keller Williams Capital Properties, Menkiti Group, PNC Bank, Verizon, and The Washington Post. For further information on sponsorship or to participate in any events, contact the Brookland Festival Committee by phone at 202-526-4848 or e-mail rl.brookland@yahoo.com. Please email Mary Hodges at maryphodges@gmail.com to sign up for any of these volunteer jobs. Saturday September 29th, 2007 - 9 a.m. to 5 p.m.
As part of Cultural Tourism DC's WalkingTown DC program, the Brookland Tour Committee will be offering neighborhood tours throughout the day. Teh "History of Brookland" tour offers insights into the development of the one-time trolley suburb and its rich heritage. Discover neighborhood architectural styles and the work of architects such as John Joseph Early, Howard Mackay, and Hilyard Robinson. See the homes of famous residents such as Ralph Bunche, Justine Ward, and Pearl Bailey (or in some cases, the sites where their homes once stood). Each tour is 1.5 hours long and meets at St. Anthony's Church at 3400 12th Street NE. Tours start at 9 a.m., 10:30 a.m., noon, 1:30 p.m., 3 p.m., and 4 p.m.
You can view more information as well as a listing of all the tours being offered that day here. You can also participate in the WalkingTown DC photo contest. DC Fire and EMS units fought a warehouse fire at 2144 Queens Chapel Road, Northeast, Thursday night. The location is off of Bladensburg Road near New York Avenue. About 60 workers were inside the warehouse when the fire started. They told 9 News Now the flames first appeared near the rooftop sometime before 8pm. They tried to put out the fire with an extinguisher, but when their efforts failed, they called 911. More than 160 firefighters were still battling the blaze three hours after it started. "This is a very significant event. You can see the plumes of smoke even in the dark," said D.C. Fire Spokesman Alan Etter. The first units responding ordered an exterior attack shortly after calling the second-alarm. The fire then grew to four alarms. "Whenever you get into a sprawling structure like this, there's always a danger to firefighters," said Etter. "Our roof team could actually see part of the roof bowing in, so that's when you got to get everybody out." At 7:50 p.m., Battalion Chief Kenneth Crosswhite, on the scene, told STATter 911 this is a 200 by 200 foot warehouse housing the DC operation of Coosemans Worldwide Produce. Chief Crosswhite said the crews were pulled out of the building because of the bowing of the exposed bar joist roof structure. He said there was fire throughout the building. Coosemans workers said there were 8 diesel trucks inside the complex as well as hundreds of boxes containing highly flammable materials. However, firefighters were able to contain the fire so it did not reach those boxes. For over 20 years, Coosemans DC has been providing some of the best specialty and exotic produce in the Washington/Baltimore area. First as Rock Garden and then joining forces with Coosemans, we have steadily grown to become a major importer, re-packer and distributor of over 400 specialty items. Mayor Adrian Fenty visited the site around 10pm. Firefighters were still using a double ladder hose to reach the deep-seated pockets inside the building. Fenty compared the fire to the Eastern Market blaze. "This is devastating," he said. Additionally, about 145 people were relocated from two nearby homeless shelters when the power was shut down on the block. You can view raw video footage shot by D.C. Fire & EMS photographer Vito Maggiolo here. Reynauld Smith, a social studies and AP American History teacher at Eastern High School, was one of three educators nationwide honored with the 2007 Harold W. McGraw, Jr. Prize in Education. According to the Mc-Graw Hill Companies, the Harold W. McGraw, Jr. Prize in Education "annually recognizes outstanding individuals who have dedicated themselves to enhancing learning in this country and whose accomplishments are making a difference today." Mr. Smith is being recognized as an innovative educator who took over Eastern's fledgling Model United Nations program in 1999, and introduced the program as part of his AP American History class. Smith has worked with 500 students in his Model UN program and has taken dozens of students to Ecuador, Portugal, the Dominican Republic and Mexico. He previously taught in Montgomery County, MD, where he helped start a diversity club for U.S. and international students. At approximately 9:07 pm on Monday, September 24, 2007, officers from the Sixth District responded to 45th and Quarles Streets, NE for the report of a shooting. Upon arrival they located 30-year-old George Hill, of the 1300 block of Cougar Lane in Capitol Heights, Maryland, suffering from apparent multiple gunshot wounds to the body. He was transported to the Washington Hospital Center’s MedStar Unit and pronounced dead. The case is under investigation by members of the department’s Violent Crimes Branch. Anyone with information about this case is asked to call police at (202) 727-9099. Police are investigating a fatal shooting in Northeast D.C. Authorities said that at about 3 a.m. on Monday, officers were called to the intersection of First Street and New York Avenue for the report of a shooting. When they arrived at the scene, police found a male victim suffering from gunshot wounds. Police said they do not yet have a suspect or motive in the shooting. As always, if you have information regarding this case call MPD at 202.727.9099. Community leaders scheduled a public-safety meeting in a Northeast neighborhood after a bloody clash among a group of Hispanic men that residents said began in an area where day laborers gather looking for work. The incident occurred at about 7:30 p.m. last Thursday, when police found a Hispanic man lying on a sidewalk and bleeding from his head near 10th Street and Rhode Island Avenue in Northeast — only a few hundred feet away from the shopping plaza. Police said the victim — who was identified only as "John Doe" in police reports — also had a stab wound in the center of his back. Mr. Chandler said his constituents who live in the area told him the man was assaulted during a fight involving a large group of men that began behind the Bank of America at 915 Rhode Island Ave.
Mr. Chandler and other residents adamantly oppose constructing the center, saying employment services already exist in the area and that city money should not be used to fund a center for day laborers, many of whom are illegal aliens. The incident caused Mr. Chandler to organize a public-safety meeting for community residents and businesses to voice their concerns to police. The meeting is scheduled for 7 p.m. on Oct. 9 at Isle of Patmos Baptist Church [1216 Saratoga Avenue NE/1200 Isle of Patmos Plaza NE] in Northeast. I could hang out at the day-laborer center and read Spanish-language materials. And if anyone ever objected to my illegal existence, I would shout racism and bigotry, because that always works, especially around pathetic, whiny white people who have this profound sense of guilt. Our useless lawmakers on both sides of the aisle are showering our dollars on illegal aliens, who turn around and wave the silly-looking flag of their country. Sorry. I forgot how it works. If they wave the flag of the country they abandoned, it is called pride. If Americans wave their flag, it is called jingoism. Mr. Thomas undoubtedly expects the legal residents of the city to follow every last law. But there he is ready to reward lawbreakers. While he is at it, he might as well appropriate more of our tax money to equip the illegal-alien center with a health spa. 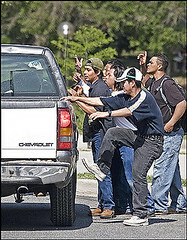 » The Washington Times, 9.20.07, "Melee spurs calls for action on day laborers"
» The Washington Times, 9.20.07, "Note to Brentwood: Don't doubt Thomas"
» WaPo, 6.17.07, "As Plan for D.C. Day-Laborer Center Idles, Anger Over Workers Grows"
» The Washington Times, 7.5.07, "Day laborers shower us with culture, irrigation"
» The Washington Times, 7.16.07, "Two sites eyed for D.C. day-labor center"
Peterson quits Washington Gateway project in D.C. 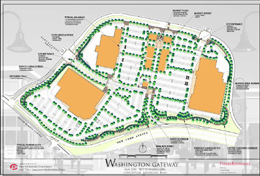 The Peterson Cos. has pulled out of the project to develop Washington Gateway, a massive retail center on New York Avenue NE that was slated to include D.C.'s first Costco. "There's a time and place for everything, and it was not the right time for us at Washington Gateway," said Paul Weinschenk, vice president of retail at Peterson. The $67 million Washington Gateway, which was scheduled to start construction next April, would have housed 412,000 square feet of retail including big-box stores, such as Staples and Target, at the corner of New York and South Dakota avenues NE. The plan was approved by the National Capital Revitalization Corp., whose responsibilities are now under the deputy mayor for planning and economic development, and received a preliminary nod from the National Capital Planning Commission (NCPC). However, this spring, the deputy mayor's office suggested changes to address any impact on the property's wetlands and alter the design from that of a big-box complex to a more contemporary look. According to Weinschenk, the changes would mean more delays and more work on a project thought to be in its home stretch. "From our perspective, we felt that until some of these issues could be worked out it didn't make sense for us to continue with this process and we needed to suspend our efforts," Weinschenk said. Fort Lincoln Realty Inc., a D.C. developer, had brought in Peterson in 2003 as the developer of the retail/restaurant portion. Peterson came back with a proposal to put in a 151,700-square-foot Costco, a 67,500-square-foot Shoppers Food Warehouse and a 123,735-square-foot space for both Staples and Target stores. People in the neighborhood loved the plan. The Advisory Neighborhood Commission 5A endorsed it, and it was seen as a destination for the 128,000 cars that drive in and out of the city daily on New York Avenue. After last fall's preliminary NCPC approval, Peterson and Fort Lincoln Realty were going to present an updated plan and either an environmental assessment or an environmental impact statement concerning the wetlands to the commission this October. The deputy mayor's office and the Office of Planning, however, had ideas that would have changed the existing plan and accommodated the wetlands in the development. "We had a different development scheme to protect the wetlands," said Harriet Tregoning, D.C.'s planning director. "If the city was interested in a Costco on the site and a Target, ... then you can't assume you will keep all the natural features on the site as they exist," Weinschenk said. "The city has to decide whether it wants those [retail] uses and allow land to be developed to support these uses, or you allow the land and its natural features to drive the uses." Tregoning said the city still wants retail on that site, which ties in with its objective to get more stores in the District. "We think the original design, which is 20 years old, can be improved upon," she said. At this point, it is unclear what will happen to the retailers that signed on or expressed interest in being a part of the project. Peterson said the leases were in various stages of negotiation, and it is up to the retailers to pursue the space. Industry insiders say Fort Lincoln Realty is looking for a retail developer to pick up where Peterson left off. A change in developers is not something new to this site. Before Peterson, there was Federal Realty Investment Trust of Rockville and Trammell Crow Development. A $10 million tax-increment financing deal was approved in 2004. The 42-acre project was expected to create 124 construction jobs and $6.2 million in new taxes for the city. All is not lost yet, said Robert King, ANC 5A commissioner. Fort Lincoln Realty is expected to give a project update at the ANC board meeting Oct. 10, including information on will happen to the retail site, and King said the news will be good. "As far as we know, the project is moving straight ahead with a new developer. The train is still on track," he said. "I have been working for 20 years on this project and would jump off a bridge if it doesn't happen." Are the DC Rollergirls Moving to NE? Come help your DC Rollergirls determine the fate of our great nation by participating in a Raucous Caucus on Saturday, September 22nd! Don’t miss the last match-up of the season between Scare Force One and the DC DemonCats! Purchase your tickets here from BrownPaperTickets.com, the first and only fair-trade ticketing service! It is with much sadness that we must announce that Dwellings will be closing at the end of October 2007. Although it was our desire to be a part of the Brookland landscape for many years to come, the store was not growing at a rate that could ultimately sustain itself. We truly enjoyed serving the Brookland community and will miss the relationships that we established with so many of you. 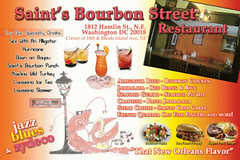 We sincerely thank you for your patronage during the past 2 1/2 years. This is a terrible loss and a severe blow to the revitalization of Brookland's retail core. While many in Brookland want to see a more dynamic and successful commercial "main street" along 12th Street, the fact remains that the neighborhood's density, along with the selection of businesses, are factors in the corridor's struggle to become a destination for shoppers. And while we'd all like shops and restaurants that serve "us" (however broadly or narrowly each resident defines "us"), we have two university communities right next door who would also utilize a commercial strip that serves them. I'd love to see the same number of CUA and Trinity students populating 12th Street Thursday-Saturday as I normally see on the Metro platform, taking their money out of Brookland and down the Red Line. Would promoting that type of foot-traffic have kept these two stores open? Would it be the impetus for more - and better quality - sit-down restaurants along 12th? We all seem to know what we want, but too often fight our neighbors and proposed density that will help get us there. First Book, a nonprofit organization, has teamed up with the Veterans of Foreign Wars, SunTrust Bank, and SunTrust Mortgage to host a book drive in DC through this Sunday, September 23rd. The drive will enable First Book to achieve its mission of providing children in low-income families the opportunity to read and own their first new books. Social venture company Better World Books will sell the books online and First Book will use the proceeds to bring thousands of new books to children in need in the DC community. Between now and this Sunday, September 23rd, you can drop off your used books at select DC SunTrust locations, or, if you don’t live in the area, donate them by following the instructions on our webpage: www.firstbook.org/betterworld. This site also provides guidelines on which kinds of books are most helpful. What: Amateur, adult volleyball - no particular skill level required; no leagues, just good exercise and neighborly fun! Despite successfully defending themselves against judge Roy Pearson and his $67 million pants (generously reduced by Pearson to $54 million), the Chung family has closed two of its three Custom Cleaners, including the 3174 Bladensburg Road, NE location. If you live or work near the Convention Center, consider taking your delicates to their Happy Cleaners shop at 7th and M, NW while they fight Pearson's appeal. A 600-pound man was found dead inside his apartment in Washington Wednesday morning. D.C. fire said they will have to use a crane to remove him from his apartment in the 1300 block of Adams Street in Northeast. The Brookland Day Festival Planning Committee is in full force and could use some help from additional volunteers and participants. 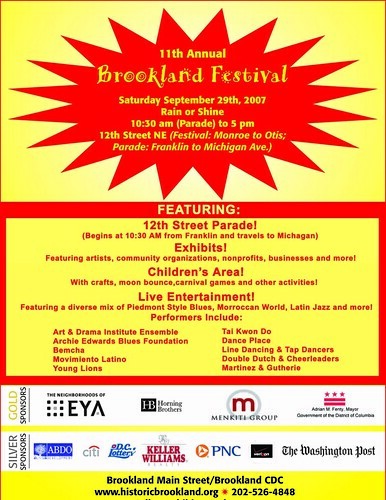 Brookland Day is a great way to promote your company or organization to the Ward 5 community. If you would like to be in the parade or have a booth at the event, please contact me (Mary Hodges) at mary@menkitigroup.com or Richard Layman at rl.brookland@yahoo.com. 4. Day of festival set up and cleanup support. We meet Mondays from 7:00-8:00 p.m. at the Brookland Visitors Center. Please email me at mary@menkitigroup.com or call 202.243.7717 if you would like to volunteer. The annual Brookland Day Festival on 12th Street NE between Monroe and Otis Streets is scheduled for Saturday, September 29th, 2007. Greater Brookland celebrates this year the 80th Anniversary of what could be considered the first Brookland Festival, held in 1927 to celebrate the paving of 12th Street NE. The occasion included a parade, an 80-piece band, remarks by District Commissioners, and dancing at St. Anthony’s Hall. In honor of this auspicious anniversary, we are planning a grand event, with special emphasis on expanding dance, music, and spoken word performances and on enhancing the Children’s Fest, an area of the Festival designed to engage children. Mark your calendars for September 29th and be sure to join us for Ward 5's premier annual celebration! Friday, 9/14 - Stacey Brooks and Friends Blues Band @ 8:00 p.m. Stacey Brooks and Friends are coming back for a repeat performance. This talented new band play well together and the stellar vocals by Ms. Stacy Brooks herself add to that blues and rhythm sound that has them performing all around the country. Saturday, 9/15 - Allan and Friends @ 8:30 p.m. Award winning local songwriter with several CDs. Allan will be releasing 2 more CDs this summer, and will be playing songs from those, as well as his earlier material. Friday, 9/21 - Meteor Band @ 8:30 p.m. This blues band has a sound all their own. Their style has people all over DC area coming in on Fridays to hear them. Get here early! Saturday, 9/22 - After Hours Band 8:30 p.m. At Saint's for the second time! If you were here last time, you may have noticed the superb showmanship, polished professionalism, and musical magic of this jazz and blues band. You know they say it only gets better the second time around! Can't wait to prove that one true! Friday, 9/28 - First Thing Smokin' @ 8:30 p.m. With a motto that reads "If you cant feel it, it ain't real," these acclaimed blues performers are always welcomed and celebrated by Saint's customers. They play national blues festivals and are known for giving people a good time. D.C. police are investigating a double shooting in Northeast. Authorities said the shooting happened in the 1200 block of Brentwood Road at about 10 p.m. Many people were hanging out in the courtyard, including two male teens, a 14-year-old and a 19-year-old, who were playing with boxing gloves, when three people in hoods walked up and opened fire, hitting the teens, News4's Pat Collins reported. Police said the victims were struck in their stomachs. Both were taken to a hospital in serious condition. Both are expected to survive. There's been no word on a suspect or possible motive in the case. People who live at the complex said violence is not unusual there. What: Join the NE DC Historical Society as they continue to explore the history of our Northeast Washington communities - past, present, and in years to come. This month's meeting will take place in the Michigan Park community. Bill Rice, Washington community historian, will share photos and other materials from the District of Columbia's Department of Transportation (DDOT) archives. NE DC Historical Society meetings take place the second Sunday of every month. Contact queenstowndc@yahoo.com for further information. I'm currently on hiatus from the Friends of the Woodridge Library due to a scheduling conflict with my monthly DC Neighborhood College classes, but this was the first group I became involved with when I moved to Woodridge, and we are always looking for new members. FWL raises money to support programs and services at the library and works with other like-minded groups to advocate on behalf of all the city's libraries. Part of this month's agenda will include tentative scheduling for our fall book sale. When: Saturday, September 8th, 2007, 11 a.m.
What: In response to the summer rash of crime in Brookland - frequently near the Metro, and most recently a mugging/shooting Saturday night on 10th Street NE in the alley between Perry Place and Quincy - Councilmember Harry "Tommy" Thomas, Jr. and MPD are hosting "Brookland Crime Solutions Meeting: Real Concerns; Real Talk; Real Solutions"
When: Saturday, September 8th, 2007, 2:30-4:00 p.m.
What: Attend this workshop and share your thoughts on the need for an inclusive job readiness, training, and employment center located in Ward 5 in close proximity to Home Depot. When: Saturday, September 8th, 9-11:30 a.m.
What it is: The Center will be an inclusive training, career, and employment center that will provide a range of services to Ward 5 residents—particularly the residents of Brentwood, Edgewood, and Montana Terrace—and other under-served groups. Why it’s needed: The Brentwood, Edgewood, and Montana Terrace neighborhoods traditionally have had high rates of unemployment. On average, one in 10 adults in these neighborhoods are unemployed. A Center that addresses employment and training needs is greatly needed for these neighborhoods. An organized system linking contractors and individuals seeking work from contractors at the Home Depot site is also needed. What it will do: The core mission of the Center will be to provide comprehensive employment and training services to residents of the adjacent Ward 5 neighborhoods and other under-served groups. The Center will offer a wide range of classes, ranging from language immersion to financial literacy and assistance with preparing local and federal income taxes. The Center will also have services geared toward manual laborers, including those seeking work from contractors at the Home Depot site. Community: The Center will include local labor and community organizations like Israel Baptist Church's Facing It Together (FIT) Academy as partners. The FIT Academy is a neighborhood-based organization with a track record of providing residents of Brentwood, Edgewood, and Montana Terrace with job training and readiness skills. In the past year, the program has placed more than 30 individuals in jobs. By linking with local labor and community organizations and leveraging their program successes, the Center will bring effective employment and job training services to Ward 5 residents and other under-served groups. A national model: The Center envisioned for Ward 5 has the potential to be a national model showcasing how employment and training services focusing on African-Americans, Latinos, and any other under-served group can be incorporated together in a single, inclusive facility. The Center brings job readiness and placement programs directly to the Ward 5 neighborhoods that need them the most.